Wärtsilä LNG solutions will power the pioneer icebreaker. 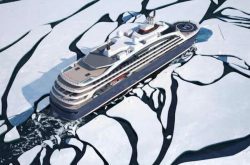 French cruise company Ponant in late 2017 commissioned VARD shipbuilding group of Norway to build a Liquefied Natural Gas (LNG)-fuelled luxury polar expedition cruise vessel, the first of it’s kind in the world. Now Finnish technology group Wärtsilä has revealed it’s 31DF dual-fuel engine has been selected to power the vessel. The order was placed with Wärtsilä in the second quarter of 2018, for installation on the vessel being built at Vard Søviknes, one of the company’s nine shipbuilding yards. In addition to four 14-cylinder and two 10-cylinder Wärtsilä 31DF engines, Wärtsilä will also supply the fuel gas supply system, chosen because of the company’s experience and references in gas containment and gas fuel systems. Also included in the scope is Wärtsilä’s Nacos Platinum advanced navigation equipment, which can later be integrated with an Eniram proactive energy management system delivering predictive insights and mobile alerts. Eniram is a Wärtsilä company. The Wärtsilä equipment is scheduled to be delivered in 2020, one year before delivery of Ponant’s polar ice-class luxury cruise vessel.